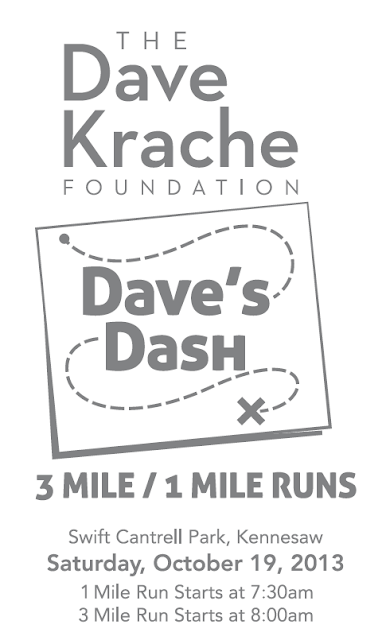 Dave's Dash is a Dave Krache Foundation event, to raise money for kids to play the sports they love when their families are in need. The event is at Swift Cantrell Park in Kennesaw on Saturday, October 19, 2013.mRegistration is limited, so we are encouraging people to sign up before Sept 27 to guarantee their shirt size! $25/runner, and "phantom runners" are allowed if you just want the shirt and don't want to run. The 1 mile walk/run starts at 7:30am, the 3 mile walk/run starts at 8am - and there will be prizes! Shirts and runners bags for all participants. Top sponsors include Big Peach Running Co., Farmers Market Baskets, Hill Mechanical, Matt Giddens Digital, Win-Tech, Inc., IHG, Chick-Fil-A, Alan Watkins, Publix, and AMLI at Barrett.